Written by: KristaG on December 1, 2017. I had a Santa’s Workshop one and my sister had this one when we were children. One of my favorite holiday traditions from when I was a child would have to be our Advent calendars! Whether they are store bought with chocolates or pictures, the really cool Playmobil ones, or even the ones filled with various food or drink items, I love them! When we were little, we would get German ones (Adventskalendar) with Christmas-y chocolate shapes inside. These would also travel with us as we went to visit family. Now that I have my own household, I still get spoiled with one filled with chocolates, but I wanted to also give back and do one of my own – but with a Geek Girl twist! 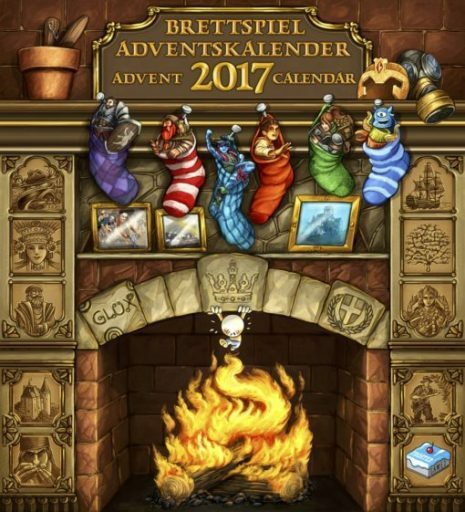 Now, before I go much further, yes, I am aware that Frosted Games puts out a yearly Brettspiel Adventskalender full of promos so I could have just gotten one of them for our home if I wanted to. However, after looking into them a bit more, the included promos seem to outnumber the games we don’t have compared to ones that we do so I’d be stuck with a bunch of promos that we wouldn’t use. For example, out of the 25 games featured this year, we only own 3 of them and only have interest in potentially adding 3 of the other games to our collection. Sadly, with only having 6 out of 25, this just isn’t a worthwhile purchase for us. I did, however, buy Santa’s Renegades last year from Renegade Game Studios. As I haven’t seen any kind of announcement for one this year, I’m not sure if they’re putting one out or not later in the season. However, since we tend to be fairly frugal in our gaming purchases, I chose to simply create my own using various items that I know we will use. 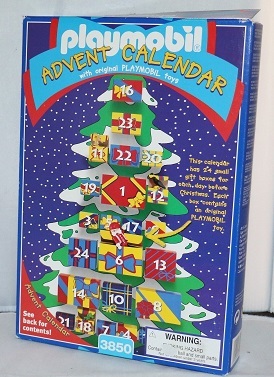 Personally, I like having Advent calendars that are multi-purpose/functional so I spent quite a bit of time trying to decide what I wanted mine to look like. To be fair, I had a really hard time deciding between 2 different styles of Advent calendar: one being more about decorating and the other allowing me to give gifts. I settled on a gift-giving plan, but may still do the other one next year (decorating a tree with homemade geek-themed ornaments, 1 per day of the month) if I have room for it in our small apartment. There are tons of “diy printables” out there, by the way! I was amazed by how many options I found! I really wanted a calendar that could double as an activity as well as a decoration, not just a basic wall calendar, so it was easier to narrow down the hundreds of results based on that factor alone. After doing some thorough searching, I settled on creating a Gingerbread Village from LittleLlamaShoppe, but it was a very hard decision for me as I loved PICAPICApapercrafts‘ Igloo with little penguins and the color-your-own Advent Calendar Town from hfcSupplies. However, as adorable as the Gingerbread theme is, I felt it didn’t quite match the geek feel that I wanted, so I added my own touch: some Daleks and a TARDIS! My completed Advent Calendar: Dr. Who vs. the Daleks in the Gingerbread Village! So many pages, yet so worth every second of crafting! So, how did I put all of this together? 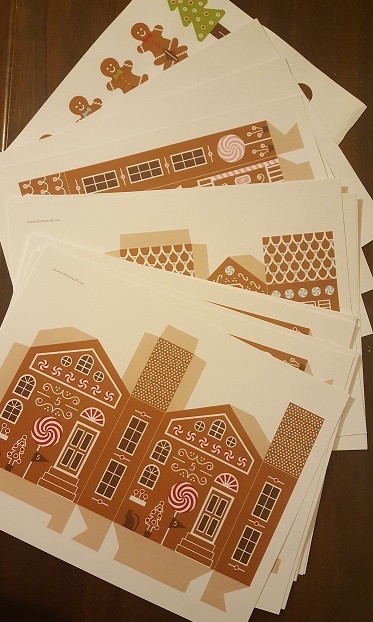 After finding a Tardis pattern by CyberDrone on DeviantArt that I felt worked with my gingerbread theme and several Dalek patterns created by Francesco Mattioli (there are variety of patterns that can be found here) from and scaling them to fit, I took all of the files (gingerbread village included) and got them printed on white card stock. I then very, very carefully cut everything out and glued each piece together all while making sure I could still easily open and close the boxes. This did take some modifying on my part, but I was pleased with the challenge. All in all, it took me about 3 hours to get everything cut out and glued together after I colored in the Daleks. Note: the PDF for the gingerbread village did come with a building for the 25th, but I chose to make that the day we open up the TARDIS so I simply cut out the 25 and glued it in place; discarding the extra building. Some example fillers. The card packs and card promos fit nicely in the larger boxes while the pins, dice, other small promos and candies that I made fit well in the little ones. The miniatures were taken out of their original packaging before being put into boxes. As for what I filled them with, I have a small collection of treats and gaming related items that I carefully put into each box. For example, I purchased a new set of polyhedral dice, which were easily split up between 7 different days! I also have some promo items that I’ve been quietly collecting that came in back issues of Game Trade Magazine for games that we do actually own/play so I placed them in boxes as well (I think my favorites are the colored Tsuro stones, but he only gets one of them and the other is mine!). I also picked up a few promos from the Board Game Geek Store fairly cheaply and from my FLGS, Great Escape Games and Comics! For the remaining boxes, I took the leftover geek themed chocolates that I’ve made as holiday gifts and placed them inside! If you don’t want to make your own, you can also find various nerdy chocolates via The Truffle Cottage (my favorites a mix between the Dr. Who collection and the Star Wars collection) or Sweets So Geek (I’m really intrigued by their Mint Mandalorians!). There are plenty of other things, however, that can be placed inside. 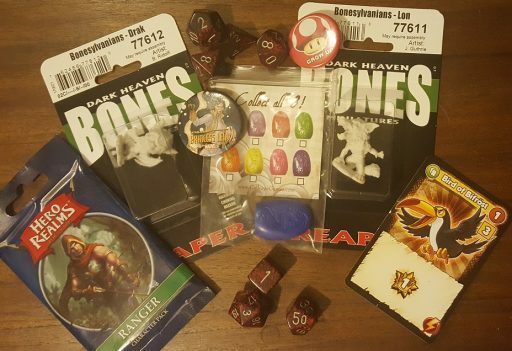 Some other examples include personalized meeples, Bones or other RPG minis, MtG singles, board game upgrades (such as token upgrades or counters), paints and brushes, or even booster packs for various games such as Pokemon, MtG, Munchkin, Star/Hero Realms, or Yu-Gi-Oh! All in all, this project was a lot of fun and I’m really excited about adding the tradition to my home for what I hope will be years to come. As stated above, I have a few other ideas on how to implement this, but I’m excited to see how it goes over before I start going too crazy with the idea. While this Advent calendar isn’t quite as portable as mine was as a child, it creates a sweet and whimsical display that fills my house with holiday cheer! The added TARDIS and Daleks appeal to the household Whovian and fit my theme for this year (it’s going to be a very TARDIS Blue Christmas here in California! ), which is an added perk. I also really love the freedom that this Advent calendar gives me when it comes to finding gaming and geeky gifts to give my gamers. The boxes can hold a variety of items due to the range in sizes and I can ensure that each item will be something of use versus things that would never hit the table!